In May 2000, Opera America honored Encompass and Founding Artistic Director Nancy Rhodes for "25 Years of Dynamic Leadership." Well-known Pianist and Conductor Mara Waldman is the Music Director/Conductor of Encompass, and Thomas Carlo Bo, Norman Carey, Jack Gaughan, Kenneth Hamrick, Sybille Werner, and John Yaffe (who served as Music Director/Conductor for 13 seasons) have conducted productions with Encompass. Among the many innovative new works staged by Nancy Rhodes at Encompass are the world premieres of Michael Stewart, Mark Bramble, Richard Engquist and Doug Katsaras' musical Elizabeth and Essex, which starred Estelle Parsons, Florence Lacey, and Richard White; Only Heaven by Ricky Ian Gordon, based on poetry of Langston Hughes, which she co-conceived with the composer; and Arif Mardin's opera, I Will Wait; American premieres of George Antheil's 1920s jazz opera Transatlantic and Venus in Africa; and recently the New York premiere of Russian composer Grigori Frid's compelling opera, The Diary of Anne Frank, which went on tour, playing four sold-out performances at the Cleveland Opera's 1,000-seat Ohio Theatre. Encompass premiered the comic operas Frustration, words and music by Sheldon Harnick, and Satisfaction, words and music by Charles Strouse, the opera Phaedra by Benjamin Britten, Postcard from Morocco and Miss Havisham's Wedding Night by Dominick Argento, Regina by Marc Blizstein, The Tender Land by Aaron Copland, Pantaloon, He Who Gets Slapped by Robert Ward, and Encompass' award-winning production of The Mother of Us All by Virgil Thomson and Gertrude Stein, as well as operas by Samuel Barber, Jack Beeson, Lukas Foss, Louis Gioia, Michael John LaChiusa, George Quincy and librettist Benjamin Barber, Richard Pearson Thomas, and Peter Westergaard. 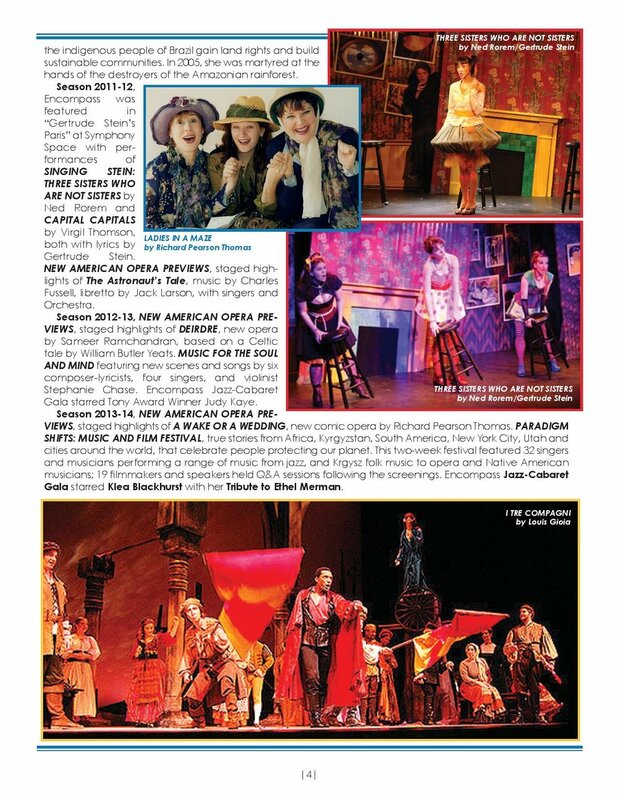 Internationally, for The Holland Festival, Encompass New Opera Theatre premiered Eccentrics, Outcasts, and Visionaries: A Century of American Opera and Song in Amsterdam, and toured four cities in the Netherlands. Dedicated to introducing American musicals abroad, Rhodes staged Bernstein's West Side Story in 2004 and Cole Porter's Kiss Me Kate in 2007 at the Albanian National Opera in the capital city of Tirana. 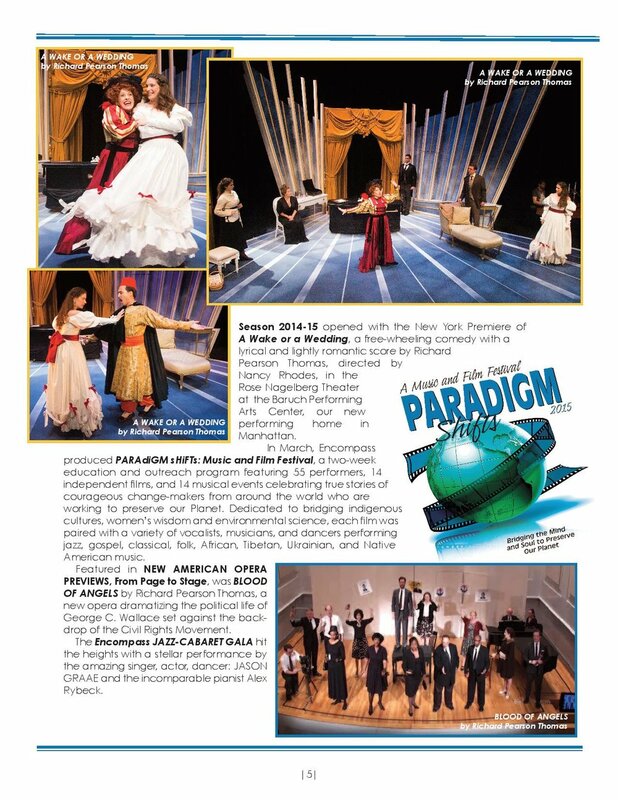 These were the first American musicals ever staged in the history of the country and were filmed for National Albanian Television. Encompass presented a double bill (titled Approaching Infinity) of Pulitzer Prize-winning composer John Harbison's A Full Moon in March, based on a play by W.B. Yeats, paired with the New York premiere of composer Hans Werner Henze's The End of a World, libretto by Wolfgang Hildesheimer and translated by Wesley Balk, for its 2003 season. In February 2004, Encompass premiered Seymour Barab's comic opera A Perfect Plan, freely adapted from a play by W.S. Gilbert, as a co-production with After Dinner Opera, in sold-out performances at the Leonard Nimoy Thalia Theatre at Symphony Space. The leitmotif providing the impetus for developing a series of new musical works is Paradigm Shifts: Breaking through Barriers. Guided by this theme, Encompass has commissioned and is developing new operas which explore the outer reaches of science and human potential as witnessed in leading visionaries of the 20th and 21st centuries - artists, writers, inventors, and physicists. The first of these new works premiered in June 2005 with A Gertrude Stein Musical Trilogy which explored the vision, genius and wit of Gertrude Stein in music. The trilogy featured Ned Rorem's Three Sisters Who Are Not Sisters and Virgil Thomson's Capital Capitals, both operas with texts by Stein herself; and the world premire of Gertrude Stein Invents a Jump Early On, a new jazz opera with music by William Banfield and story and text by poet Karen LaLonde Alenier. In June 2008, Encompass composer Philip Hagemann teamed up with George Bernard Shaw to musicalize two of his most fascinating plays which explore literary inspiration and passion - The Dark Lady of the Sonnets and Passion, Poison and Petrifaction. This witty double-bill, Shaw Sings!, with singers and orchestra, played to sold-out performances at Symphony Space. 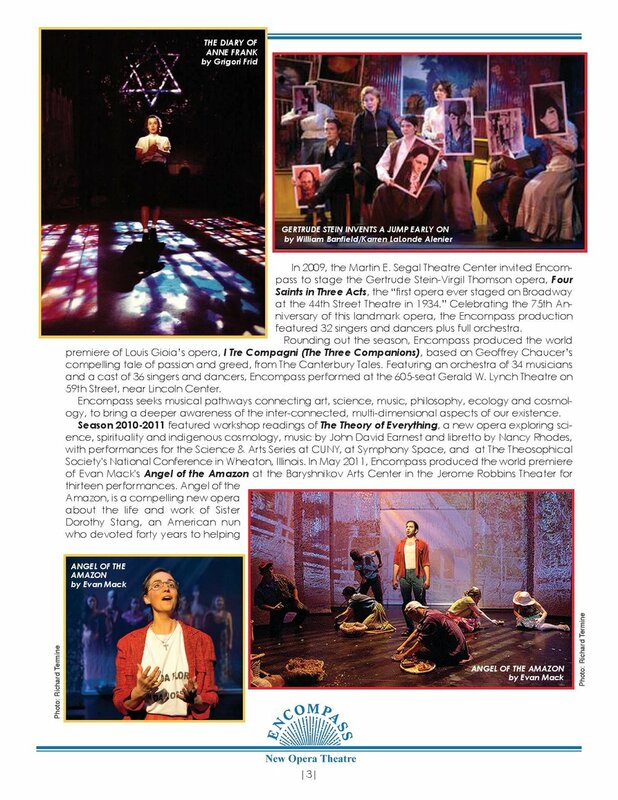 In 2009, the Martin E. Segal Theatre Center invited Encompass to stage the Gertrude Stein-Virgil Thomson opera, Four Saints in Three Acts, the "first opera ever staged on Broadway at the 44th Street Theatre in 1934." Celebrating the 75th Anniversary of this landmark opera, the Encompass production featured 32 singers and dancers plus full orchestra. Rounding out the 2009 season, Encompass produced the world premiere of Louis Gioia's opera I Tre Compagni (The Three Companions), based on Geoffrey Chaucer's compelling tale of passion and greed, from The Canterbury Tales. Featuring an orchestra of 34 musicians and a cast of 36 singers and dancers, Encompass performed at the 605-seat Gerald W. Lynch Theatre on 59th Street, near Lincoln Center. Encompass seeks musical pathways connecting art, science, music, philosophy, ecology and cosmology, to bring a deeper awareness of the inter-connected, multi-dimensional aspects of our existence. 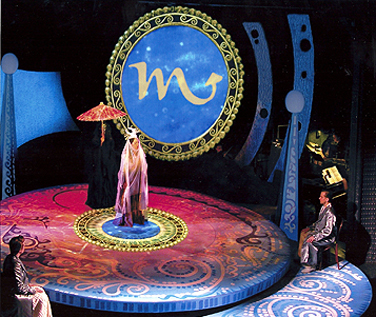 On May 12, 2007 and May 6, 2006, at the Skirball Center for the Performing Arts, Encompass presented staged highlights from The Theory of Everything, a new opera exploring science, spirituality and indigenous cosmology, music by John David Earnest and libretto by Nancy Rhodes in New York City Opera’s VOX: On the Edge program. 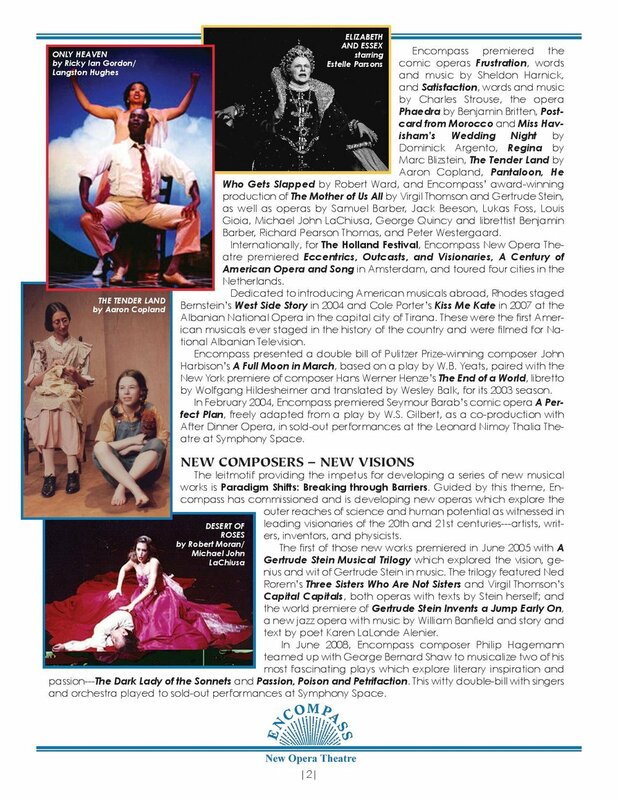 In Season 2009-2010, Encompass presented three concert readings of The Theory of Everything on November 12 at The South Oxford Space, November 14 at Elebash Hall under the auspices of the Science & Arts Series at CUNY, and December 9 at the Leonard Nimoy Thalia at Symphony Space. Season 2010-2011 featured workshop readings of The Theory of Everything with performances for the Science & Arts Series at CUNY, at Symphony Space, and at The Theosophical Society's National Conference in Wheaton, Illinois. In May 2011, Encompass produced the world premiere of Evan Mack's Angel of the Amazon at the Baryshnikov Arts Center in the Jerome Robbins Theater for thirteen performances. Angel of the Amazon is a compelling new opera about the life and work of Sister Dorothy Stang, an American nun who devoted forty years to helping the indigenous people of Brazil gain land rights and build sustainable communities. In 2005, she was martyred at the hands of the destroyers of the Amazonian rainforest.